"This is a delicious omelet with a little bit of a twist. I promise you will love it as much as my family does." Bring a medium pot of salted water to a boil. Add potato and cook until tender but still firm, about 15 minutes. Drain, cool, peel and slice. Preheat oven to 350 degrees F (175 degrees C). Beat together eggs, salt, pepper and parsley. In a cast iron skillet, heat olive oil over medium-high heat. Saute onion and red pepper until soft, then stir in mushrooms. When mushrooms start to shrink, add the chopped ham, potato and tomato slices. Pour in the egg mixture; gently stir to combine. Sprinkle cheese on top of eggs and place skillet in preheated oven. Bake until eggs are firm, about 10 to 15 minutes. Allow to cool briefly before serving. 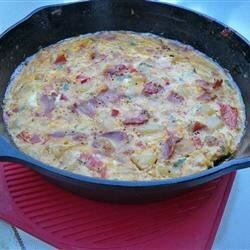 Ham and cheese baked omelet is an excellent meal for breakfast or brunch. This is a pretty good recipe with lots of room to experiment with your own ingredients. Will add more cheese next time. We don't have any young KIDS so I,m writing this reveiw as a senior citizen who has a cl. problem!!! This was a great meal for dinner but I baked it in a pie shell to make it like a quiche. It is definitely a "keeper" recipe.